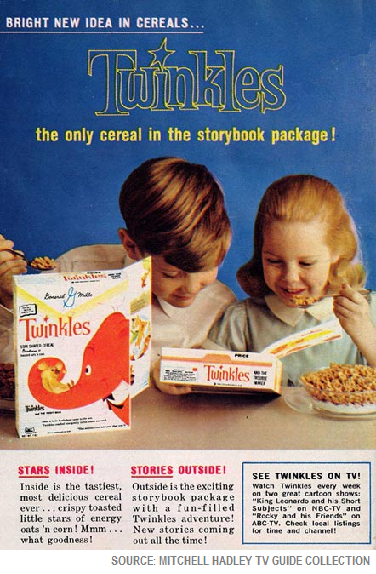 A 1961 TV Guide ad for Twinkles, the storybook breakfast cereal. The back cover of TV Guide was usually reserved for cigarette ads – I wonder how much General Mills had to pay to get this prime space? Twinkles the elephant was created by Total TV, and although it never had a series of its own, it appeared as a frequent commercial on many of the cartoons of the day, particularly Linus the Lionhearted. Eventually the FCC blew the whistle on Twinkles ("this isn't entertainment - it's advertising!")*. *Try telling that to the ad executives who come up with the Super Bowl commercials. And do you really want us to believe those viewers are less impressionable than kids? Twinkles wasn't the only breakfast cereal with a TV tie-in, though - check out this wonderful page for more of your favorite animated cereal characters.